Guess what day it is? Guess what day it is? It's Mask Monday! This Mask Monday I am reviewing the Leaders Insolution Brightening Recovery Masks. I have been using these masks for quite a while now and it is one of my well liked masks. The first Leaders mask I tried wasn't so awesome, so I worried that I would feel the same for other Leaders masks. I worried quite a bit because I purchased a bunch of Leaders masks a while ago. What would I do if my skin doesn't like all of them? However, you know the saying: "you'll never know until you try." So, I gave it a try, and I am glad that I did. 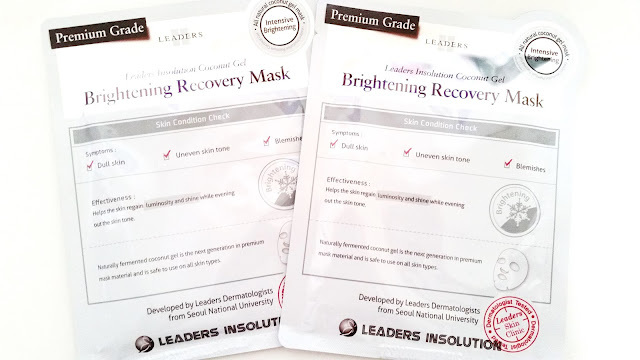 The Leaders Insolution mask line is Leaders' first line of masks and also quite a popular line at that. They are made with Leaders' naturally fermented Coconut gel, which is Leaders' signature. It's also what makes them stand out from other masks on the market. Leaders recently repackaged their masks, although the formulas are still the same. 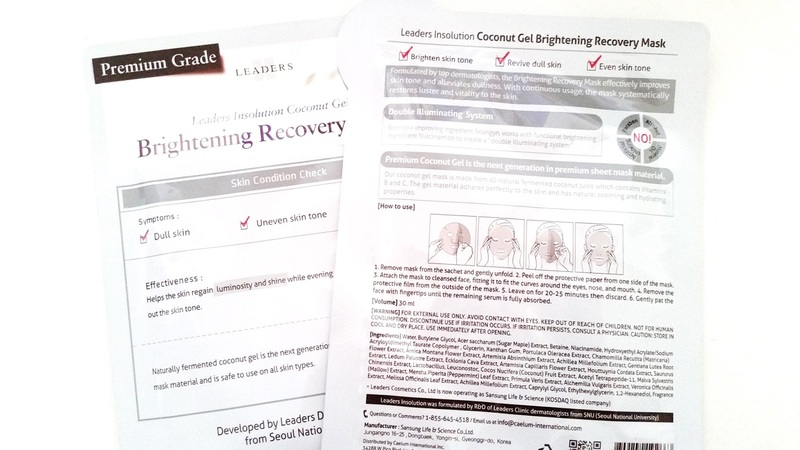 Anyways, let's get to know these Leaders Insolution Coconut Gel Brightening Recovery Masks! 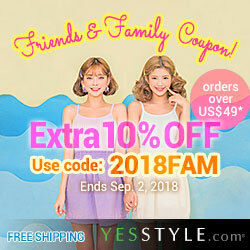 Product Description: A moisturizing mask that brightens up dull and uneven skin tones. It can help to improve skin complexion and reduce discoloration. The mask contains Telangyn, which is a skin tone improving ingredient. Telangyn works with niacinamide to create a double brightening effect to help restore a flawless complexion. 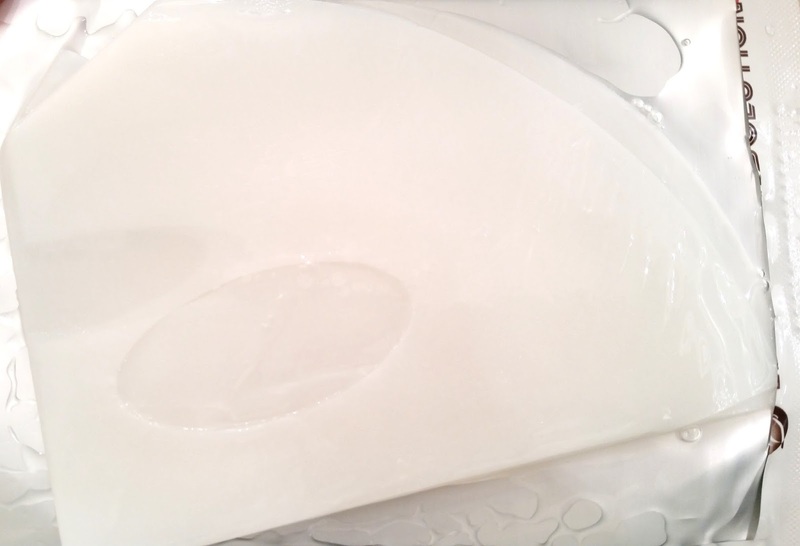 The mask also contains vitamin rich ingredients that can help to heal discoloration. With long term use, the masks can restore vitality and luster to the skin. To Use: Cleanse the face first. Take the mask out of its packaging and remove its protective layers. Apply the mask onto the face and leave it on for 20 to 40 minutes. Remove the mask and pat in any remaining essences. Ingredients: Water, butylene glycol, acer saccharum (sugar maple) extract, betaine, niacinamide, hydroxyethyl acrylate/sodium acryloyldimethyl taurate copolymer, glycerin, xanthan gum, portulaca oleracea extract, chamomilla recutita (matricaria) flower extract, arnica montana flower extract, artemisia absinthium extract, achillea millefolium extract, centiana lutea root extract, ledum palustre extract, ecklonia cava extract, artemisis capillaris flower extract, houttuhmia cordata extract, saurunis chinensis extract, lactobacillus, leuconostoc, cocos nucifera (coconut) fruit extract, acetyl tetrapeptide-11, malva sylvestris (mallow) extract, mentha piperita (peppermint) leaf extract, primula veris extract, alchemilla vulgaris extract, veronica officinails extract, melissa officinalis leaf extract, achillea millefolium extract, caprylyl glycol, ethythexylglycerin, 1,2-hexanediol, fragrance. Packaging: I find Leaders masks always have a lot of information on their packages, which is nice. The information and descriptions are in English, which is great. 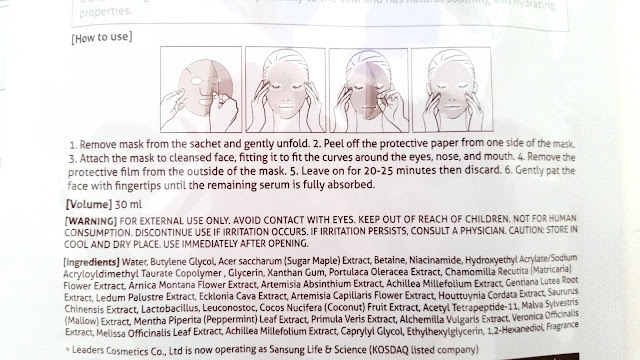 The front of the mask has some bullet point information and the back of the mask package contains more detailed information. 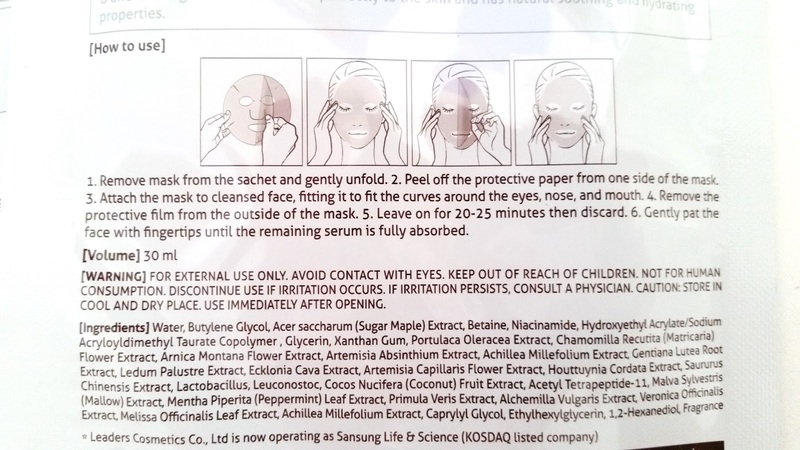 The mask on the inside comes with 2 protective layers which needs to be removed before using. Scent: This mask has a floral scent. It's a bit more than mild but lightens quickly and doesn't smell like much on the face. The floral scent is likely from the added fragrance. Color: The mask is milky and opaque. It looks almost see through but not exactly. Texture: The Coconut Gel masks reminds me of hydrogel masks but doesn't quite feel like them either. These feels softer and a bit thinner. They also feel fragile but they sticks on nicely. Kind of like saran wraps, they just sticks on the face so well despite the mask being large in certain areas. The serum in this mask is also a bit thicker than other masks. My Thoughts: I didn't think I would like these Brightening Recovery masks as much as I do. Especially since the previous Leader's Coconut Gel mask I tried wasn't that great for me. However, I'm glad that I gave these a try because they are much better in my opinion. I always patch test new masks. I start by testing the serum/essence before testing the mask on my face. It's usually a 1 to 2 day process depending on what I find or what I don't find. By testing the serums first, I can eliminate ones that irritates me faster. Plus, it gives me an idea of what I'll get from the mask, e.g. scent, essence texture, if it dries sticky, etc. The Brightening Recovery mask passed my patch test and I was quite happy with the results it had on my skin. Simple put, it's a great brightening mask. It has noticeable brightening effects, which I am very fond of and I would say this is one of my favorite brightening masks. It's also really moisturizing and softens my skin too. The uniqueness of these coconut gel masks is that it just sticks on your face so well. Despite its larger shape and odd cuts, it just clings onto your face like saran wrap and you can talk and move around without it falling off. The downside though, is that it makes it a bit hard to remove, especially if it starts to dry or is dry. 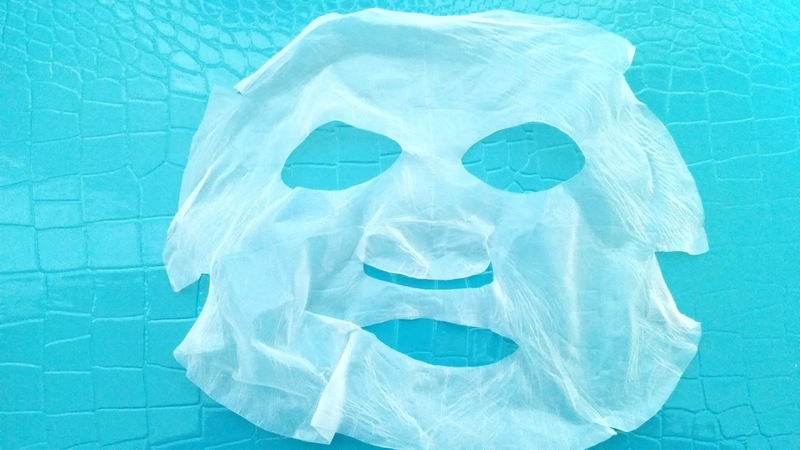 This is one mask you don't want to fall asleep in because removing it while it is really dry isn't fun at all. 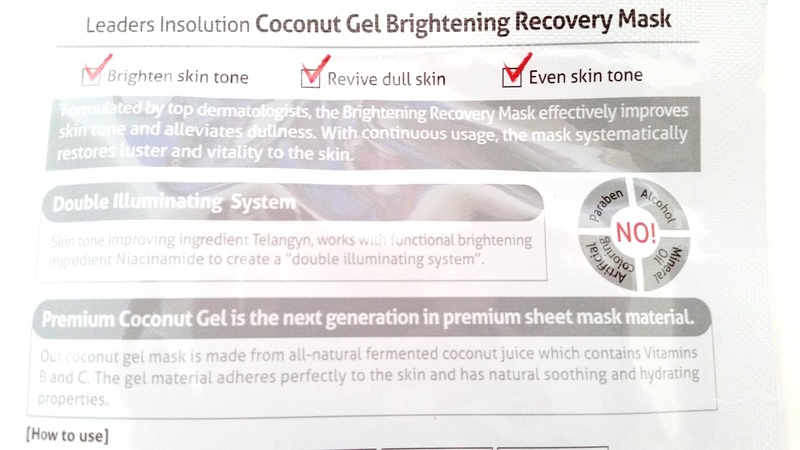 Final Thoughts: I have quite a few of these Leaders Insolution Coconut Gel Brightening Recovery Masks stocked up because I really like them. The brightening effects, suppleness, moisturizing properties, and softening effects keeps me coming back for more and I love it. The mask is on the bigger end for me and the cut isn't that great at all but it sticks on so well like saran wraps that the size/cut doesn't seem like a big deal at all. I just need to fold it a little here and there to make it work. Would I repurchase it in the future? Yes! I've already made repurchases of these and I will no doubt buy them again. Do I think these are worth a try? Yup! This is one brightening mask that's totally worth every penny. It not only brightens well but also moisturizes, softens, and adds suppleness to the skin. If those are the skincare properties you are looking for in a mask, then I suggest you give these a try.